Cheltenham specialist The New One is set for his 15th start at the Home of Jump Racing in the £325,000 G1 Sun Bets Stayers' Hurdle on St Patrick's Thursday, March 15. It will be his first attempt at three miles and seventh appearance at The Festival. Trainer Nigel Twiston-Davies spoke about The New One today at a Cheltenham Racecourse-organised media stable visit to his Gloucestershire stables ahead of The Festival, which happens over four days next month - Tuesday, March 13 to Friday, March 16 inclusive. He said: "I expect The New One and Wholestone will dead-heat in the Sun Bet Stayers' Hurdle! No, I don't know as it is a whole new game for The New One, while Wholestone has done well all season. "Wholestone likes Cheltenham - he got slightly outstayed in the very heavy ground last time, but the ground won't be like that at The Festival and I am sure he will get home. "I am not confident about three miles for The New One at all, which is why we have hung on so long to try him over it. "We will be riding The New One differently and so on - we won't be making all. He has won over two and a half miles quite a few times, but is he really staying on then? I don't know. "Looking at the races he has run this season, The New One is probably better than he has ever been. I think his races have been incredible this season and the handicapper thinks so too as the horse is still very highly-rated. "We had to have a go at the Champion Hurdle trials this season because they are so valuable and he has run well in all of them. He just has this huge earning capacity at two miles and he is likely to go back to that distance next season. That is where the money is and if he is earning £200,000 a year why do anything else? "The New One has already won a championship race at The Festival as he took the Neptune Investment Management Novices' Hurdle in 2013 (now the Ballymore Novices' Hurdle). "He is the horse of a lifetime - it would be nice to win the Stayers' Hurdle as it was so sad when the first Champion Hurdle was there for the taking and he was knocked out of it. 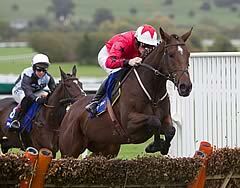 "Sam (Twiston-Davies - son and jockey) has been keen to try The New One over three miles for a long time." Reacting to the fact that this will be The New One's seventh run at The Festival, the trainer said: "That is quite a statistic and hopefully he will be running there next year too. The New One has been very kind to us. Wholestone is proven at the distance, while The New One isn't, so it is impossible to say which will do better on the day. "The New One would have a good chance if he stays the trip. We're not going into the race confident about the trip, but if does stay - people are telling me that he will and that he'll improve for the trip - then he has a very good chance. He's won races having been held up so that isn't an issue." The Twiston-Davies-trained gelding's first outing at Cheltenham came on his second career start when he lined up in the High Sheriff Of Gloucestershire's Junior Bumper on New Year's Day in 2012. The New One had made a successful debut in a Warwick bumper and was sent off the 11/2 second-favourite behind the John Ferguson-trained Trespasser. Ridden by the trainer's son, Sam, who has partnered the gelding in 32 of his 36 career starts to date, The New One, always handy, was driven out in the final furlong to record a length-and-three-quarter length success. As a dual bumper winner, The New One was allowed to take his chance in the Weatherbys Champion Bumper at The Festival in 2012 and finished an honourable sixth behind Champagne Fever, who went on to win the Sky Bet Supreme Novices' Hurdle at The Festival the following year. 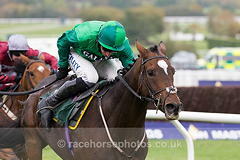 The New One progressed to win the G2 Aintree Champion Bumper the next month, defeating My Tent Or Yours. More success followed the following season when The New One was sent over hurdles. A win at Cheltenham in October, 2012 was sandwiched in-between victories at Newton Abbot and Warwick, but he tasted his first defeat over the smaller obstacles when beaten a neck on heavy ground by At Fisher's Cross at Cheltenham in January, 2013. With the benefit of hindsight, this turned out to be a praiseworthy performance as At Fisher's Cross went on to win the Albert Bartlett Novices' Hurdle at The Festival. Third-placed Coneygree stepped up to take the 2015 Timico Cheltenham Gold Cup, while fourth-placed Whisper triumphed in the 2014 Coral Cup. The New One's next start at Prestbury Park in what is now the G1 Ballymore Novices' Hurdle, was his first and only success at The Festival to date. Willie Mullins' unbeaten hurdler Pont Alexandre was sent off the 6/4 favourite, but The New One, returned at 7/2, stormed up the Cheltenham hill to record a famous four-length victory. The New One's Cheltenham appearances have been limited largely to the G2 Unibet International Hurdle and the G1 Unibet Champion Hurdle ever since. His record in the two races could not be more different though. The son of King's Theatre won the Unibet International Hurdle in 2013, 2014 and 2016 (when partnered by Richard Johnson for the first time) and was the length and a quarter runner-up to old adversary My Tent Or Yours in the 2017 renewal. The New One has not been able to better his third place in the 2014 Unibet Champion Hurdle (behind Jezki), finishing 5th in 2015 (behind Faugheen), 4th in 2016 (behind Annie Power) and 5th again in 2017 behind Buveur D'Air. Since chasing home My Tent Or Yours in the Unibet International in December, The New One has finished runner-up to Buveur D'Air in the G1 Unibet Christmas Hurdle at Kempton Park on Boxing Day and landed the G2 Unibet Champion Hurdle Trial for the fourth time at Haydock Park on January 20. The admirable 10-year-old has been victorious 20 times in total, earning over £1-million in prize money, and has only finished out of the first four just four times in 36 starts. Nigel Twiston-Davies said: "Wholestone could run a big race at a decent price. His jumping is good and he's a lively outsider. Wholestone has been running well all season, hasn't he. He likes Cheltenham and just got slightly outstayed there last time [G2 galliardhomes.com Cleeve Hurdle] in that heavy ground and it won't be heavy this time, so he has a good chance. "He was an excellent novice last season and he ran well in the Albert Bartlett, so he could be a horse at a price who could run well." A three and a quarter-length winner of the G2 Dornan Engineering Relkeel Hurdle on New Year's Day at Prestbury Park, Wholestone was a three-length second to the Nick Williams-trained Agrapart on his latest start in the G2 gallairdhomes.com Cleeve Hurdle at Cheltenham on January 27. Wholestone, successful four times in seven Cheltenham starts (never been out of the first three at the course), is entered in the G1 Sun Bets Stayers' Hurdle over three miles at The Festival. Nigel Twiston-Davies declared: "Ballyoptic has a good chance in the RSA Chase. Sam may possibly ride and it was a very good run at Wetherby last time. He did everything right and bounced back to form after Kempton. He must be my best chance of a winner at The Festival this year along with The New One." Ballyoptic joined Twiston-Davies in early 2016 and made a stellar start over hurdles, winning his first four starts over hurdles, which included a neck success over the Willie Mullins-trained Bellshill in the G1 Doom Bar Sefton Novices' Hurdle over an extended three miles at Aintree in April, 2016. Last season, Ballyoptic ran with credit in a number of staying hurdle races, which included a final flight fall in the G1 Long Walk Hurdle at Ascot in December, 2016, when challenging the eventual winner Unowhatimeanharry. Fourth to the same rival in the 2017 G2 galliardhomes.com Cleeve Hurdle at Cheltenham, Ballyoptic was pulled up in the G1 Sun Bets Stayers' Hurdle at The Festival 2017. Switched to fences after one run over hurdles this term, Twiston-Davies' charge has won twice over the larger obstacles in four starts. That included a 13-length victory over the talented Elegant Escape at Exeter in November and a gutsy two and three-quarter length victory over Sue Smith's Vintage Clouds in a G2 event at Wetherby on his latest start. Ballyoptic also came home fourth to Paul Nicholls' Black Corton in the G1 Kauto Star Novices' Chase at Kempton on Boxing Day. He is entered in the G1 RSA Insurance Novices' Chase over an extended three miles and the G1 Sun Bets Stayers' Hurdle over three miles at The Festival. Nigel Twiston-Davies commented: "Jameson has done nothing wrong all season, though two miles was too quick for him last time. He will go for the Close Brothers Novices' Handicap Chase." Jameson has had just five runs for Twsiton-Davies since joining the yard this season from Nicky Henderson, for whom he won a novice hurdle over two miles and four furlongs at Ffos Las in April, 2017. Second to West Approach on his first start for his new stable in a beginners' chase at Ffos Las in October, 2017, the six-year-old went one better with a game neck victory in a two and a half mile novices' handicap chase at Sandown Park in November, 2017. Since coming home second to Oldgrangewood in a valuable handicap chase over the same distance at Newbury in December, Jameson has finished last of four in novice chase events at Cheltenham and Newbury over two and a half and two miles in December and January. He is entered in the JLT Novices' Chase and the Close Brothers Novices' Handicap Chase at The Festival. Nigel Twiston-Davies said: "It was a nice performance at Kempton last time and The Festival is something we're definitely looking at. We didn't do much differently with him, but it was a smaller race last time - he had come down in the handicap and he is a quality horse." Nigel Twiston-Davies said: "He was a winner over two and a half miles at Cheltenham and he is the sort of horse who could pop up and win a handicap." He has since gone on to register close to 2,000 successes, with his 1,000th winner coming at Stratford in October, 2006. Born on May 16, 1957, Twiston-Davies rode 17 winners as an amateur under Rules and gained a further 17 point-to-point victories, and served as assistant trainer to Richard Head and Fred Rimell as well as spells with Kim Bailey and David Nicholson. Since 2009, Twiston-Davies' business partner and assistant trainer is former stable jockey Carl Llewellyn, who enjoyed two Grand National winners thanks to Party Politics in 1992 and Earth Summit in 1998. His biggest winners this season include Bristol De Mai in the G1 Betfair Chase at Haydock Park on November 25 and Splash Of Ginge in the G3 BetVictor Gold Cup at Cheltenham on November 18. He had two sons with his former wife Cathy . The eldest, Sam, 25, is stable jockey to leading Jump trainer Paul Nicholls and still rides regularly for his father. William (Willy), 23, a successful rider on the Flat and over jumps, announced earlier this season that he will not be returning to race riding. He wants to become a trainer eventually after working in bloodstock. The Irish Independent Leading Trainer Award at The Festival went to Ireland's Gordon Elliott for the first time in 2017. Elliott sent out six winners across the four days to edge out narrowly Ireland's champion Jump trainer, Willie Mullins, who also had six successes but one less runner-up. Mullins is the second most successful trainer of all time at The Festival, with 54 victories, four behind Lambourn-based Nicky Henderson, who enjoyed three wins in 2017. Four trainers gained their first success at The Festival 2017 - Stuart Edmunds, Alan Fleming, Ben Pauling and Nick Williams. An award for the leading owner at The Festival was instigated in 2017. This award, sponsored by NetJets in 2018, went to Michael O'Leary's Gigginstown House Stud with four winners. J P McManus was next with three successes and he broke the 50-winner mark at The Festival. He is the winning-most owner ever at The Festival with 52 victories.